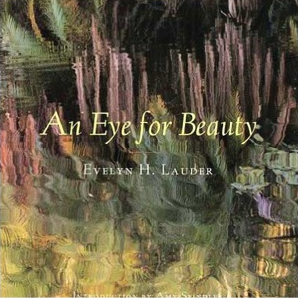 Ten Beauties has been published on the occasion of the opening of Evelyn Lauder’s exhibition at Pace/MacGill Gallery in New York Cty, November 2005. This elegant portfolio contains 10 color photographs in 11 x 14” size, signed, numbered and matted, and housed in a custom-made archival box with an accompanying essay by Evelyn H. Lauder. All proceeds from the sale of the portfolio benefit The Breast Cancer Research Foundation. There are a total of 50 portfolios in the edition, which sells for $3,750. Beauty, they say, is in the eye of the beholder, and one of the pleasures of looking at the work of a gifted photographer is being able to see what the photographer sees, even when a subject is not beautiful in the classic sense. As an artist, Evelyn Lauder enables us to see beauty in all her subjects – beneath the surface, in a detail others might overlook, in a composition that focuses our attention on what she finds special in a particular scene. In her first book of photographs, The Seasons Observed, Evelyn Lauder presented a selection of images that captured the natural beauty of different parts of the world during the cycle of the seasons. Building from her previous work, this volume, An Eye for Beauty, offers a wider range of the photographer’s sensibility. Along with breathtaking vistas – mountain ranges, sunsets and sweeping landscapes – there are exquisite, enlarged details of patterns made by rippling water, trembling leaves, luminous flowers and scattered stones. As the book progresses, we begin to sense a human presence in the landscape – in an abandoned dock, a beached boat, a garden maze – and ultimately the figures of people in their own settings. Although the human impact on nature is increasingly evident, the photographer allows us to see beauty in man-made objects as well as in untouched natural settings. 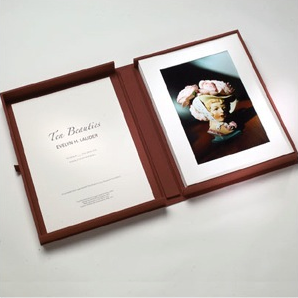 For information about Evelyn Lauder’s “Ten Beauties” limited-edition portfolio, Eye for Beauty book, and limited-edition photographs to benefit The Breast Cancer Research Foundation, please contact info@evelynlauder.com or call 646.497.2600. 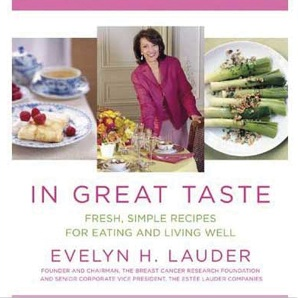 Evelyn Lauder’s In Great Taste: Fresh, Simple Recipes for Eating and Living Well cookbook is available wherever books are sold and through www.amazon.com. Lavishly illustrated with beautiful four-color photographs, this 224 page, hardcover book features more than 125 vibrant recipes that will delight the senses and enhance health and well-being. 100% of Mrs. Lauder’s royalties benefit The Foundation.